Foil Accents: Besides embossing, it is also common for higher end decks to feature foil accents. For a classy look, gold and silver foil are the colors of choice, but sometimes creators will experiment with other colored foil, including red, blue, and even black. These give parts of the tuck box an instant reflective shine, creating a very luxurious look. For a duller shine, metallic inks can be used in place of foil, but there's no doubt that gold and silver foil accents are hard to beat for the ultimate look of luxury, especially when combined with embossing. Innovation:, Besides the use of metallic foil and embossing, another technique to look for on a tuck box is the use of iridescent colors or UV spot printing, which can add further visual and even tactile elements by a secondary printing process that applies an extra layer of gloss on selected parts of a card. Some publishers are even innovating with the use of fabric and embroidery on their tuck boxes. You'll also come across decks with a custom die-cut tuck box, which effectively creates a small window that allows you to see and feel part of the card backs inside the box. Borders: White borders are the most common, and probably still make the best card backs today. Since playing cards are made out of paper, cards with black borders or black faces tend to to show signs of wear and chipping as the cards are used with any frequency. White bordered cards wear in the same way, of course, but since the wear usually shows up as white, it is far less obvious with a white-bordered deck. Borderless: Some decks feature card backs without borders. 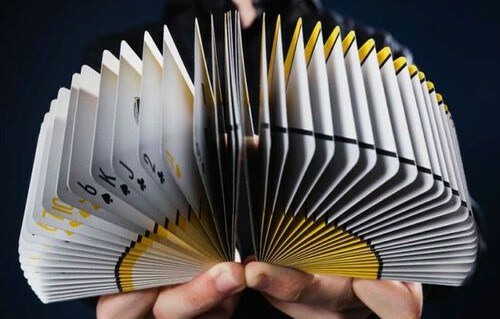 These kinds of card backs tend to look fantastic for card flourishing moves like fans and spreads, and cardistry decks will often take good advantage of this. Magicians however tend to prefer cards with borders, because cards reversed in a deck are far more noticeable when the cards are borderless, making certain sleight of hand moves far more difficult to execute. It all depends on what you're using your deck for as to whether or not borderless cards are something that suits your need - they certainly can add an instant aesthetic appeal. One-way designs: The usual standard in playing cards is that the card backs are a symmetrical mirror-style image, thus making them fully reversible. A one-way design can look more impressive on its own, and can also be put to advantage by a magician, especially if it is subtle. But in most cases, a one-way design is less than desirable, because when shuffling and using the cards, they will invariably end up being in different directions. This quickly looks messy, which is why most prefer two-way or symmetrical designs. Simplicity: Ideally the back of a playing card should have an immediate visual appeal even from a distance, and be easily recognizable and memorable in a bold way. This quality has led to the success of big names like Bicycle and Bee, which have very distinct designs with clear features. Even a detailed design should have a clear shape or style that is immediately noticeable at first glance. Detail: While a playing card is helped by having a striking boldness and simplicity of its overall design, for the person who is drawn in by the design, it should reward them with fine detail that emerges upon close examination. The Bicycle deck serves as a good model here, because while it features two immediately obvious symmetrical circles as the main design, a close study of the details reveals an angel riding a bicycle. Creativity: Probably the most important thing about a card back, however, is what you personally think of it. Does it strike you as original and creative? Does it immediately grab you as beautiful or appealing? Obviously the artistic design of a card back is often linked to the overall theme of a deck, but there's also a very personal element of what strikes you as beautiful. Inks: Some decks will employ metallic inks on the card backs, and this immediately produces a very striking and stylish look, with a sheen that becomes obvious when the cards catch the light at certain angles. Foil: Taken to an extreme, some decks go the full hog and have metallic foil hot stamped on the back. This looks super luxurious and impressive, but comes with two disadvantages. Firstly, the shape of the hot stamped foil can sometimes carry through and be visible to the front of the card. Secondly, foil tends to be more slippery, and this will often impact the handling of the cards. But it does add a great deal of instant bling to a deck, and foil backs look super impressive! Customized Courts: Besides the Aces and Jokers, court cards are one of most important places you can expect to find customization. These are probably the first cards you should be looking at, because what the designer has done with these will often tell the story of the deck. After all, the court cards comprise a dozen characters altogether, and this really gives an artist something to work with besides mere pips. Sometimes the court cards are merely a variation of the traditional courts, perhaps with an adjusted color scheme or style. But often this is the place in a deck where a creator has opted to use the full extent of their artistic license in a creative way. The traditional characters may even appear as animals, or some other unorthodox but yet creative creature or object. Court cards can vary a lot from deck to deck, but often a decision about whether or not a particular deck is for you will in part be based on what you think about the court cards. Customized Faces: We haven't yet mentioned the color of the overall canvas of the face cards. Instead of white, there may be a highly decorative pattern, or perhaps a vintage look. 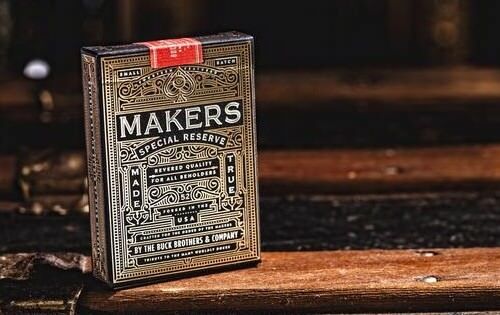 Some playing cards have even been cleverly designed to have the look of metal, wood, or denim. All of these kinds of features can add appeal and interest, helping make a custom deck more creative and unique. Publisher: Fortunately we live in a time in which there are several industry leaders, all of which produce high quality playing cards that are durable and functional. United States Playing Card Company (USPCC) has a very long history in the playing card industry, and seeing their name on a deck of playing cards is almost always going to be an indication of quality in performance. But USPCC certainly does not have a monopoly on quality playing cards, and in recent years we have seen the emergence of a couple of publishers that print high quality playing cards in factories in Taiwan. 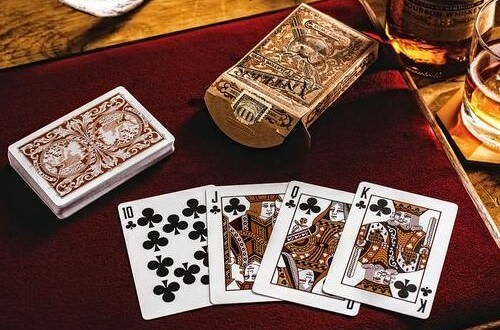 Special mention should be made of Legends Playing Card Company (LPCC) and Expert Playing Card Company (EPCC), who often work together and even share use of the same factory. While they offer a slightly wider range of finishes, in my experience their products match the level of quality found in a USPCC deck, and sometimes exceed it. Smaller companies like Hanson Chien Playing Cards and BOMBMagic also print in Asia, and have produced some high quality decks. 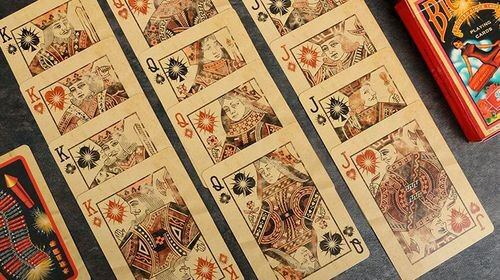 European printer Carta Mundi has also been starting to produce high quality custom playing cards in recent years. Typically you want to avoid decks produced by cheap printers in China, or by lesser known publishers, although there are some exceptions. Cut: The cut of the cards refers to how cleanly the edges of the cards have been cut from an uncut sheet in the process of turning them into individual cards. 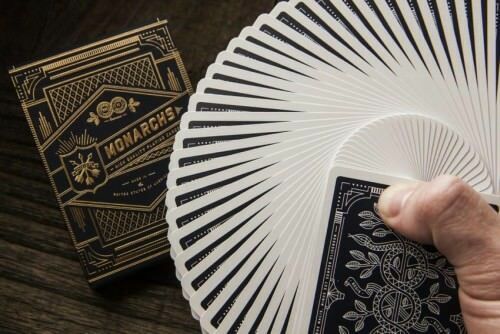 The edges of cards produced by LPCC/EPCC tend to have a much cleaner and smoother cut than a USPCC printed deck, and when you run your fingers over one of their new decks, you can immediately tell that it is super smooth, with beautiful clean edges, which assists in making maneuvers like a perfect faro far easier. The direction of the cut can also be important. Some decks will have a "traditional cut", while others have a "modern cut". Most USPCC produced decks have a modern cut, which simply refers to the direction in which the cards are cut. A traditional cut will naturally favor face-down faro shuffles, while a modern cut will naturally favor face-up faro shuffles. For the average person, this will not make much difference, unless you are heavily into doing faro shuffles, and the direction of these really matters. Card games: If you are primarily into playing card games, then your cards are going to see some heavy usage, and you want to make sure they are durable, and handle well during shuffling. Even more important, you want to make sure that any custom elements of the design do not get in the way of the deck's functionality. A deck might look pretty, but if you cannot easily tell the difference between spades and clubs on the indices of the cards, for example, or if the red and the black suits have similar color pips, you are going to find that this will make playing a card game difficult. Some customization is acceptable, but for the card player it should largely be limited to the card backs, the Jokers, and sometimes all the Aces and court cards. Given all the criteria above, is there still room for personal taste when choosing a deck of cards? Absolutely! Just like some people like chocolate ice cream while others prefer vanilla, which deck appeals to you will very much be a personal matter. When looking at a deck of cards, you do so through a set of eyes that is shaped by your own experiences and beliefs, and with your own personality. Everyone brings their own unique perspective to the table of observation and appreciation, and so what appeals to you might not appeal to another person. But that's perfectly fine! By all means find something that suits you, and that has a combination of colors, artworks, design, and style, that speaks to you, and feels "right". So do take the time to consider everything carefully before you make a purchase. Fortunately we live in a time of privilege, and before we buy we can usually have the benefit of seeing images of the tuck boxes and the playing cards inside. Online retailers like PlayingCardDecks.com do a good job of helping us with this, by having an image gallery readily available, to showcase clear pictures of the deck that we are thinking of buying. While this might spoil the "surprise" of discovering what is inside a newly bought deck, I think we would all prefer to avoid any unpleasant surprises after a purchase. And let's be honest, in most cases taking a peek at the contents in advance just makes us all the more hungry for a deck, rather than making us want to avoid it! One aspect that was left out was “marked” decks. I always find myself checking whether or not a deck is marked before purchasing. Sometimes it can be a really nice addition to the deck, while other times it can really ruin a “would be” nice deck of cards. I have created three decks, printed them in small runs, and given them away to friends and family. I am curious to know if you think them worthy of a large print run and the effort needed to market them. Would you review card decks to estimate the quality?